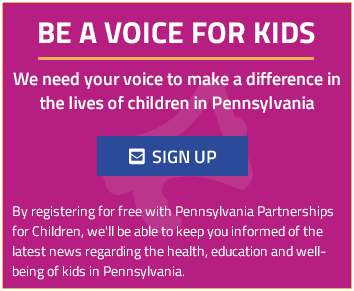 Pennsylvania Partnerships for Children (PPC) presented Sen. Judy Schwank (D-Berks) with its annual “Be Someone for Kids” award in recognition of her work to enact public policies that benefit the commonwealth’s children. Continue Reading »"PA Partnerships for Children Honors Sen. Schwank for Dedication to Children’s Issues"
Budget proposal includes substantial investments in early learning, K-12 education and efforts to support strong parenting. Continue Reading »"Governor’s 2018-19 budget proposal shows strong commitment to children"
New report urges 2018 election candidates to support pre-k investments to improve PA’s economic competitiveness. Continue Reading »"Pennsylvania ranks in bottom half of per capita investments in high-quality pre-k"
The Pennsylvania Children’s Health Insurance Program (CHIP) turns 25 tomorrow but instead of celebrating, families of the more than 178,000 children currently enrolled face uncertainty and possible termination of coverage notices if Congress fails to extend funding that expired on September 30th. Continue Reading »"Little Cause for Celebration: CHIP Families Could Get Termination Notices as Program Turns 25"